The Times of Swaziland Newspaper dated 13/06/2015 reported that another suspect has died while being tortured by the Criminal Investigation Department of the Royal Swaziland Police Force based in the Manzini Police Station. This was after the man who has now been named as Luciano Reginaldo Zavale, a Mozambican national, was arrested at his business as a hairdresser in front of his customers who were shell shocked at the comments made by the police officers when then boldly said that was the last they were seeing of him. This all unfolded at 8:30am only for the police to announce a couple of hours after his arrest, that he had suddenly died while being interrogated. Of course he had died because they made sure they carried out the threat they made in front of his customers while arresting him. It has now been reported that these officers are being protected by the State, according to the Times of Swaziland dated 17/06/2015 they have been instructed by their superiors to remain in the police camp for their own ‘safety’. So their safety is far more important than their immediate arrest for the crime they have committed. A Man has died in their hands and there is absolutely no one to answer for that crime! This is the injustice we are always condemning at Swazi Vigil and one of the very reasons that I joined the Swazi Vigil group of political activists. The continuing state of injustice and violation of human rights in Swaziland at the hands of King Mswati’s Tinkhundla System of government which is all about the benefit of a minority of his loyal friends while the masses of Swazi citizens starve and suffer without justice! Enough is enough! 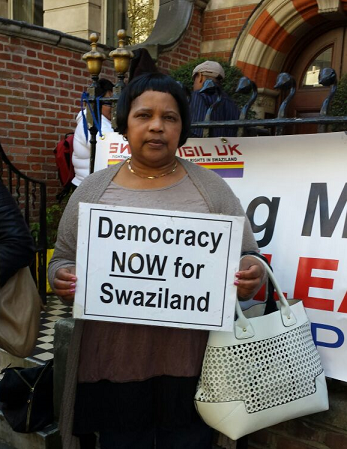 We shout for democracy and equality in Swaziland! 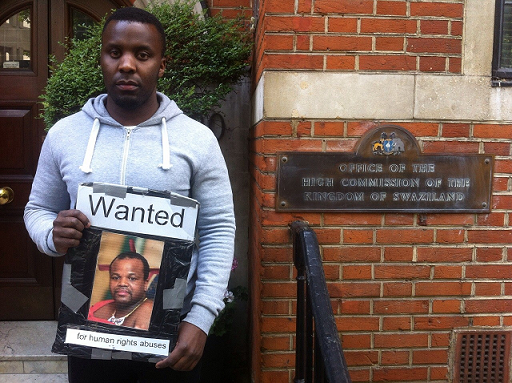 The Swaziland High Commissioner in London, Mrs Dumsile T. Sukati, was left flustered when she was confronted by human rights activists at the Swaziland Vigil outside the Swaziland High Commission on Saturday, 13th June 2015. Mrs Sukati was travelling in her official Mercedes on her way to cucumber sandwiches with the Queen on the occasion of the annual ceremonial military parade Trooping the Colour. 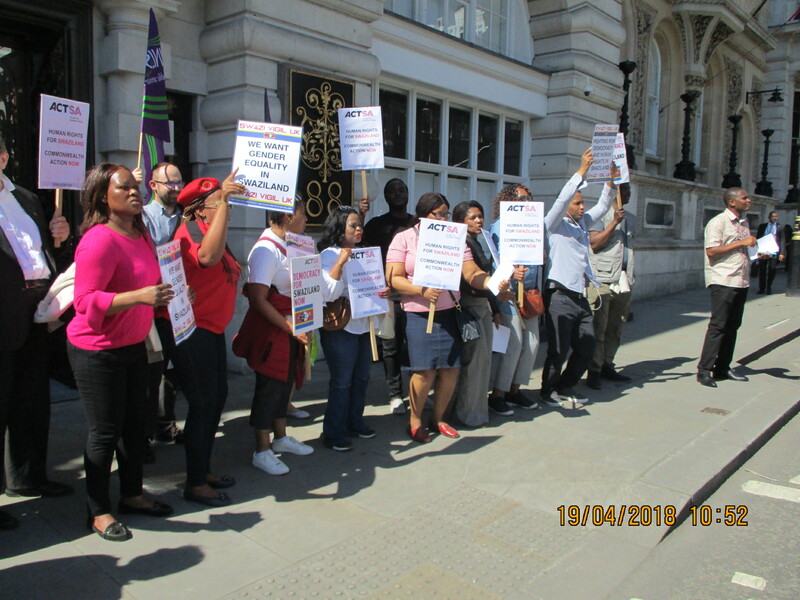 The Vigil had noticed that they were being closely monitored by someone who appeared to be an official from the High Commission, which is near Buckingham Palace. Suddenly a car flying the Swaziland flag emerged. Unfortunately for the High Commissioner it was stopped by traffic lights and the activists pounced, reducing the envoy to hiding her face behind a magazine. They demanded to know why there was no democracy in Swaziland and that King Mswati must go. When the car at last made a desperate escape, the High Commissioner was visibly shaken. Perhaps she felt better after a few cucumbers . . .